When last seen together at a high rate of speed, Kyle Busch was spinning off the racetrack into a watermelon patch in Georgia, and fellow Las Vegan Noah Gragson was driving by him to finish fourth. 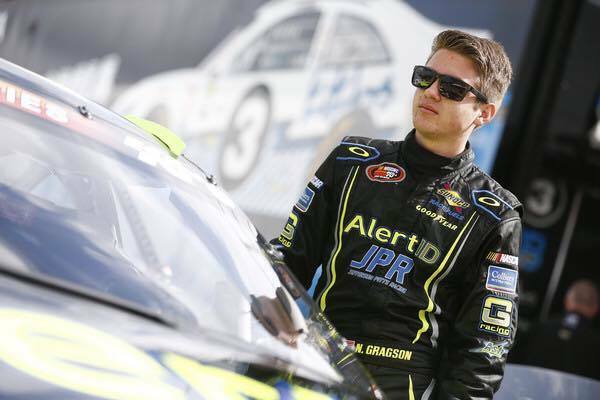 Noah Gragson of Las Vegas, 18, will make his NASCAR Truck Series debut this weekend at Phoenix International Raceway. Gragson will drive a Toyota Tundra for Kyle Busch Motorsports. (Noah Gragson). 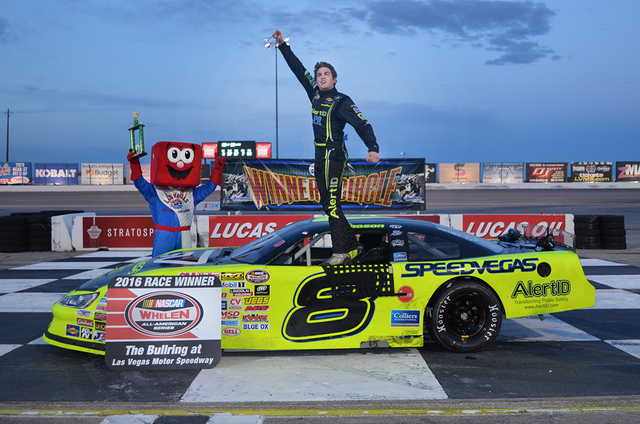 When last seen together at a high rate of speed, Kyle Busch was spinning off the racetrack into a watermelon patch during a super late model all-star race in Georgia, and fellow Las Vegan Noah Gragson was driving by him to finish fourth. Now that’s something one doesn’t see every day. “I’m 1-0 against him,” Gragson, 18, chuckled about their 2016 meeting. In a couple of weeks, Busch will be signing Gragson’s pay stub. Gragson will drive the No. 18 Switch Toyota for Kyle Busch Motorsports in the Truck Series race two days before the Daytona 500. 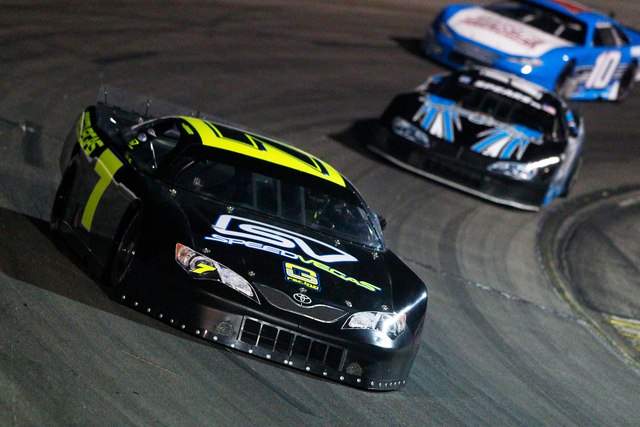 But this weekend, they will be friendly rivals one final time, at the SRL Winter Showdown — a super late model race at Kern County Raceway in Bakersfield, California, that pays a handsome $30,000 to the winning driver. Auto racing types say it’s cool Busch remembers the bullrings from whence he came, and still trades paint with the weekend warriors when his schedule allows. “They have a pretty strong field lined up again this year … and then you add in some of the West Coast guys like Derek Thorn, David Mayhew and Noah Gragson, who will be running one of my trucks full time this season, and it has a lot of great drivers,” Busch told Speed 51.com. Gragson said he is excited to be running against his new boss again. Erik Jones, another Busch protege who will drive the No. 77 Toyota for Furniture Row Racing in this year’s Cup Series, also is entered. “He’s bringing his own stuff from his shop in North Carolina, and we will be on different teams, but I am sure we will work together and feed each other information,” said Gragson, who will drive for Jefferson-Pitts Racing, the Pacific Northwest team for which he competed in last year’s K&N Pro Series. IndyCar team owner Sam Schmidt of Henderson said recently retired Tony Stewart would be competitive driving Schmidt’s third entry in May’s 101st running of the Indianapolis 500. Schmidt also put to rest speculation the three-time Cup Series champion will drive the car, which Stewart’s foundation will sponsor. Schmidt said a driver probably will be announced in the next two weeks, and that this week’s announcement brought a lot of unemployed drivers “out of the woodwork.” Stewart, who last raced in the Indy 500 in 2001, will be involved in the decision, Schmidt said. He left the door open that a NASCAR driver could wind up driving the third car, or even a driver from the Midwest dirt racks that spawned Stewart. The two had been talking about the deal for about 60 days, Schmidt said. The Team One Care Honda is expected to create awareness in the Flint Animal Cancer Center at Colorado State University, of which Stewart is a benefactor. Under NASCAR’s new “enhanced” points system, races will be broken into three segments, with bonus points awarded to top drivers in each of those segments. It has been determined the checkered flag — or a new flag that marks the end of these segments — will fall on laps 80, 160 and 267 at the Kobalt 400 on March 12 at Las Vegas Motor Speedway. How that will affect strategy is anybody’s guess, but at least those sitting in the grandstand will be able to plan their restroom breaks accordingly.